How does Position Magnet work? Want to find new candidates who are similar to employees already in the role you want to fill? Position Magnet can help. With Position Magnet, SeekOut uses this information to automatically create a search for new candidates who are a great fit for the role. Click to expand the Position Magnet section. Enter the Company and Title of the role you are trying to fill. SeekOut will find the most appropriate candidates for this role. These candidates are not it that role currently, but they share many characteristics with people who are already in the Position Magnet role. If you click on Magnet Details next to a candidate you'll see what parts of their background makes them a good match for the target position. And you'll see links to other people who have already made the move from the candidate's current position to the role you entered in Position Magnet. When you start with Position Magnet, you can narrow still use any SeekOut filters, keywords, or Boolean search terms. 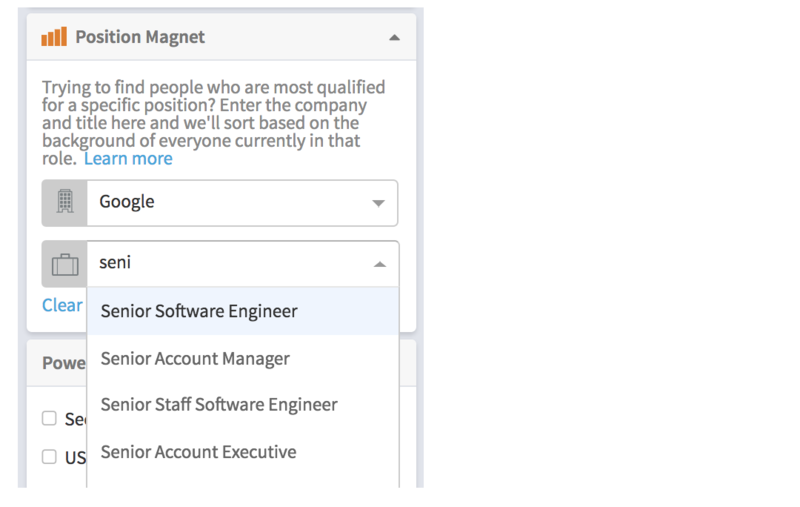 For instance, use Position Magnet to find a pool of candidates who look like current Sales Managers at Salesforce, then use the filters to narrow down to just the ones who live in Illinois. 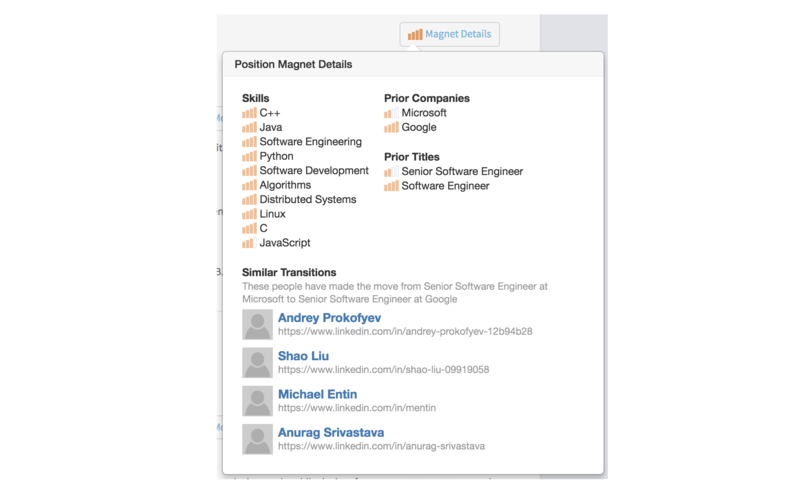 Position Magnet also works well if you're trying to hire the type of people your competitor (or another company) hires. Just use a role at that other company as the magnet. Not all roles are available in Position Magnet. We need enough data to be able to build a model of what good candidates look like. 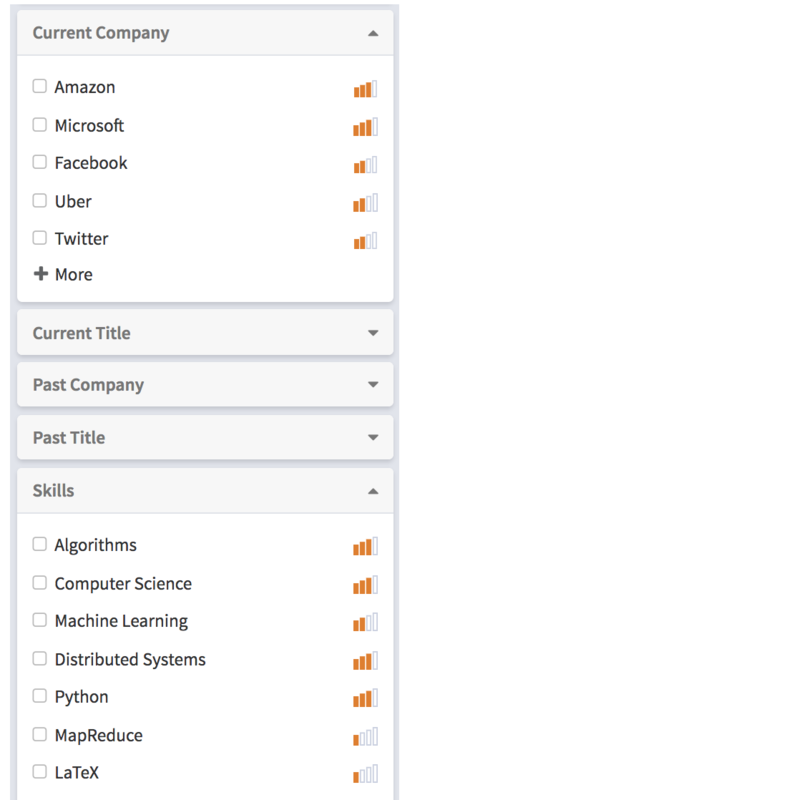 If your role doesn't appear, try setting Position Magnet to a more common role, the same role at a larger company, or a similar role at a competitor. Try it out and let us know what you find. If you have any questions or feedback, please let us know.